I first put a few words on paper soon after my divorce almost twenty years ago. It was a simultaneous process of venting and reflection about my marriage that had lasted over twenty years. Writing about it was one of many processes that helped me through this difficult time. That initial manuscript became a very short ebook that I published with minimal time and energy on my part. 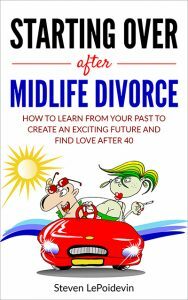 I recently returned to the manuscript, beefed up the content, changed the title and republished it as Starting Over After Midlife Divorce. Some baggage is constant, some changes. It depends on the trip. In any case, there is always baggage you should leave behind, but nobody ever does. It is the same with life as you move on after a divorce. As a singe person, we don't have much more than a carry-on, but after marriage and divorce, there may be enough baggage to fill a few suitcases. Now it's time to choose what to take with you for the rest of your journey and what to leave behind. I'm sure everyone goes through similar thoughts and processes after it is all over. Let's spend a little time discussing the most common ones and the choices you have to deal with them. How you deal with your feelings of grief, despair, betrayal, anger, abandonment and fear about the future will determine how successful your post-divorce ife will be.